I read a lot of blogs. Well, actually, I'm not sure what constitutes a lot. But I like to read blogs. Food blogs, "lifestyle" blogs, parenting blogs, ya know. I didn't read many "mom blogs" before having my own child, but after she was born I felt like it was a good way to put what I was going though in perspective and also to get ideas about how to do things or activities or whatever. However. The blog world is weird. Some blogs are so rosy and cheery you want to puke. Others are so negative and whiney it drives me crazy. Comparison is inevitable, but then again comparison is the thief of joy so we should try to avoid it all costs. Right? Hmmm. But still, I read some blogs where the author's kids seem to be running around happy all day long, and I think to myself, "what's up with my kid?" Willa is great. Fantastic. Obviously. But she is certainly not happy all day long. And often, the day I organize a special outing is the day she's happy for the shortest period of time. But stil, we get out there. We do things. We live life! You have to, no? Because the happy is sometimes even less when we're trapped in the house! 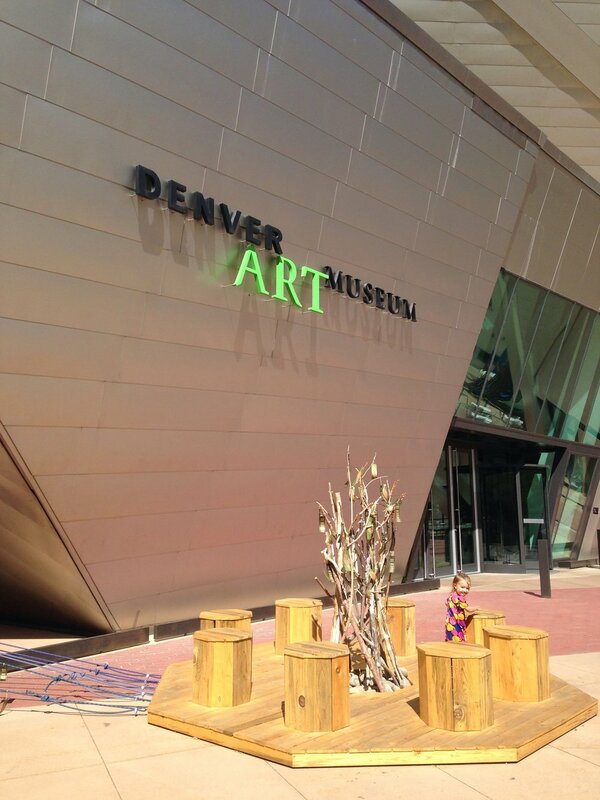 Last week, we met up with our playschool friends for a morning at the Denver Art Museum. And while for some the idea of taking kids to a museum might not be the most appealing, let me tell you, it was awesome! Museums these days are so hip. They have activities for kids wherever you look. And sure, some are a ways above the toddler level, but there's so much to see and explore and do. It made for a really fun morning. Most importantly, Willa was completely full of happy! Even when I put her in her swimsuit so we could play in the outdoor splash fountains on our way out but they'd inexplicably turned off. 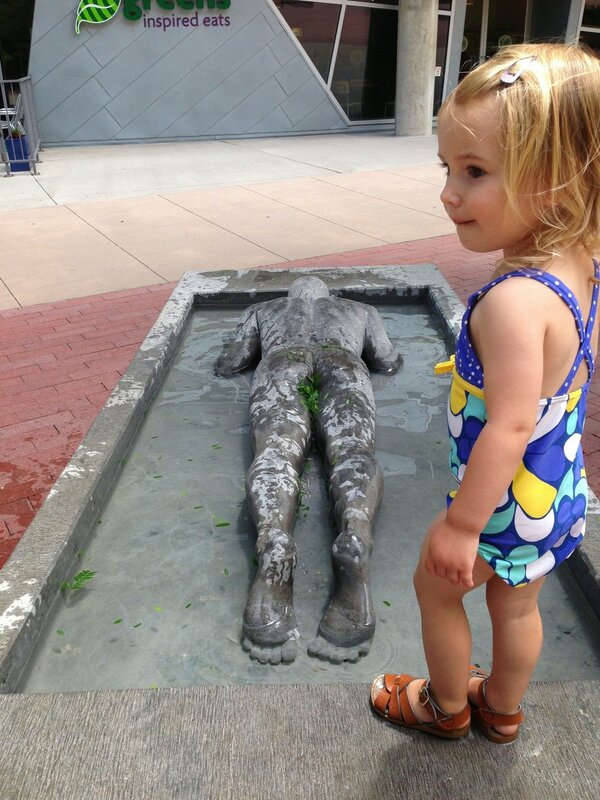 She just jumped in the water next to face-down sculpted man and was happy as a clam. So take that blog-world. My kid is smiling while out and about on the town too! P.S. 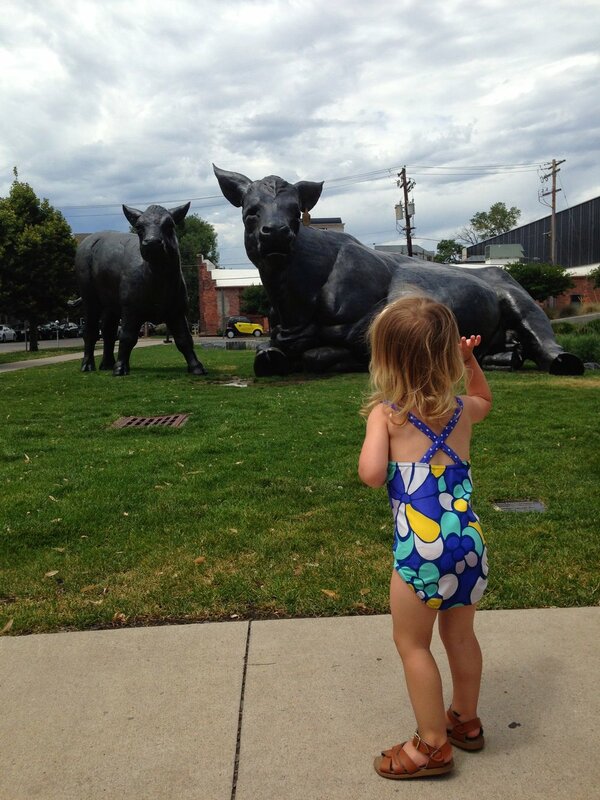 That last picture is Willa air high-fiving the giant cow sculptures. She's pretty much the awesomest.